It’s the Sermon on the Plain! In an age of massive and growing wealth disparity, I can’t think of a more subversive, powerful, eye-opening message than the words of Luke 6:17-26. It clashes against everything we know, against a world that has been crafted over generations to raise some to unfathomable opulence while billions more struggle to sustain themselves. Blessed are the hungry, the grieving, the despised… in what way are they blessed? The pangs of hunger eat young and old alike from the inside out. Tears blur the eyes and choke the throats of millions who have lost loved ones to war, disease, famine, blistering heat or freezing cold as they go under or unsheltered, homes lost to poverty, disaster, war. The marginalized and reviled – the prisoners thrown away and discarded – how are they blessed now? These blessings sound like security in times of trouble. And what brings security in times of trouble? Enough money can inoculate against some of the worst disasters. It affords food and drink in times of drought, more stable shelter in times of natural disaster, and while it can’t buy health, it can buy healthcare. And reading Jeremiah alone, one might be led to believe in a prosperity Gospel, where trust in God equals financial security. The flip side of this is even more disturbing: failure and hardship is blamed on lack of faith, and there is no incentive to help those who are less fortunate. It can feel to us as if God’s blessing is in wealth, and God’s blessing is for the rich to the exclusion of the poor. It can feel this way, but human feelings and intuition can be deceptive! 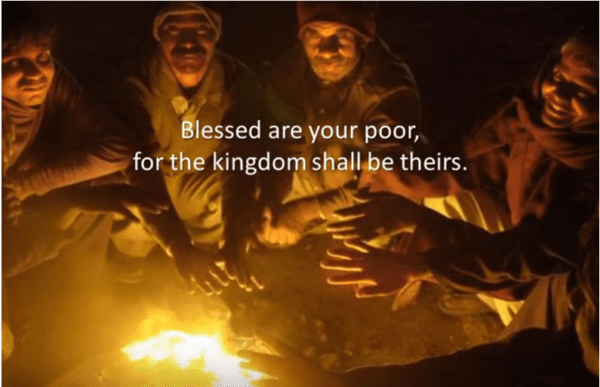 In Luke, Jesus tells us instead that the poor are blessed. How can this be? The poor live on the underside of a world built on sacrifice, a world in which we worship a deceptive god built up of our own insecurities and worst tendencies. The world of sacrifice is built on believing that some must be blessed and others cursed. The malaise of sacrifice and death that permeates the world comes from the lie that murders, expels, and exploits some for the profit and prosperity of others. It comes from building unity and community at the expense of scapegoats and enemies, designated others against whom one may feel superior or “blessed.” To believe the poor are poor because they are cursed is to believe in a false god. Many who are poor have lost faith in a world of deception. And, often for survival, the poor turn their faces and put their trust for survival in where they, and we, can find the true God… in each other. We tend to think about the poor in need of our help, but the deeper truth is the other way around. Throughout history, the poor have come to the aid of one-another, forming coalitions not only to lift the burden of their own poverty, but to rebuild their communities, their nations, the world itself on a more solid foundation of solidarity and cooperation rather than enmity and exclusion. As we discuss Jeremiah and Luke, I will talk about times when the poor have not only been blessed, but been a blessing to everyone. Those of us who have some wealth, who may not be rich by modern standards but who also are not poor, have much to learn from solidarity movements among the poor and marginalized such as the Poor People’s Campaign. We are called not only to give of our resources, but to listen and dedicate our energy and understanding to learning to those whose perspective from the underside of sacrifice can help us to build a world free of sacrifice. I will give some examples especially pertinent to Black History Month, such as the fact that public education has its roots in African Americans and Reconstruction. And I will talk about the resolution for a Green New Deal. The GND calls on us to learn from and build a new world following the leadership of the poor and marginalized. Whatever you may think of the Green New Deal proposals, the emphasis on listening to the poor and marginalized is right on. Finding ourselves in solidarity with the poor, following their lead, and redefining our understanding of wealth is how we will be blessed. We will also be blessed to have you join us!